Successfully Added Lenovo ZUK Z2 Smartphone - 5 Inch FHD Display, Snapdragon 820 CPU, 4GB RAM, 64GB Memeory, 4G, Quick Charge, Fingerprint (Black) to your Shopping Cart. The 5.0 Inch Lenovo ZUK Z2 smartphone with its 2.5D Arc Screen and Gorilla Glass protection brings flagship specifications at affordable prices. The Lenovo ZUK Z2 represents true value for money as this flagship killer is a beautifully created device that is sure to entice. Surrounded by tough Gorilla Glass this slim smartphone has some top end hardware to match its pristine, sleek looks. Boasting a 2.15GHz snapdragon processor and a whopping 4GB of RAM it delivers cutting edge processing of epic portions. With an Adreno 530 GPU delivering faster graphics processing the ZUK Z2 won't let you down when multitasking, gaming or playing media. Due to its high-end hardware the ZUK Z2 needs a reliable OS to get the best from it - enter the Android 6.0 OS with Lenovo's own custom ZUI launcher, the perfect balance to get the most from the top specs. Combining folder management, lock screen controls, enhanced security and customizable interface the ZUI UI ensures easy and efficient hassle free operations. With its 5 inch, full HD 2.5D arc screen the ZUK Z2 has the perfect interface for games and movies cramming in 440 pixels per inch for a pin sharp image a joy to the eyes. For quick easy access, the ZUK Z2 can be unlocked with its fast fingerprint scanner - taking a fraction of a second to grant you access while still maintaining the highest levels of security. Connectivity is immense with two nano SIM card slots each supporting 8 4G frequencies so you can access the fastest cellular services from most corners of the globe. Keeping you going for longer and delivering up to 14 hours of usage from each charge is a 3000mAh battery. As the ZUK Z2 makes use of Quick Charge technology you will have virtually no downtime as it can be fully charged in as little as 2 hours from its future proof USB type C port, which also doubles for super fast data transfers. The ZUK Z2 can also snap some fairly impressive pictures with a high-end 13MP camera that brings stunning HD pictures to capture all your magical memories. The 8MP front camera another impressive feature that brings top quality selfies so you can snap the perfect profile pic for your social media accounts. 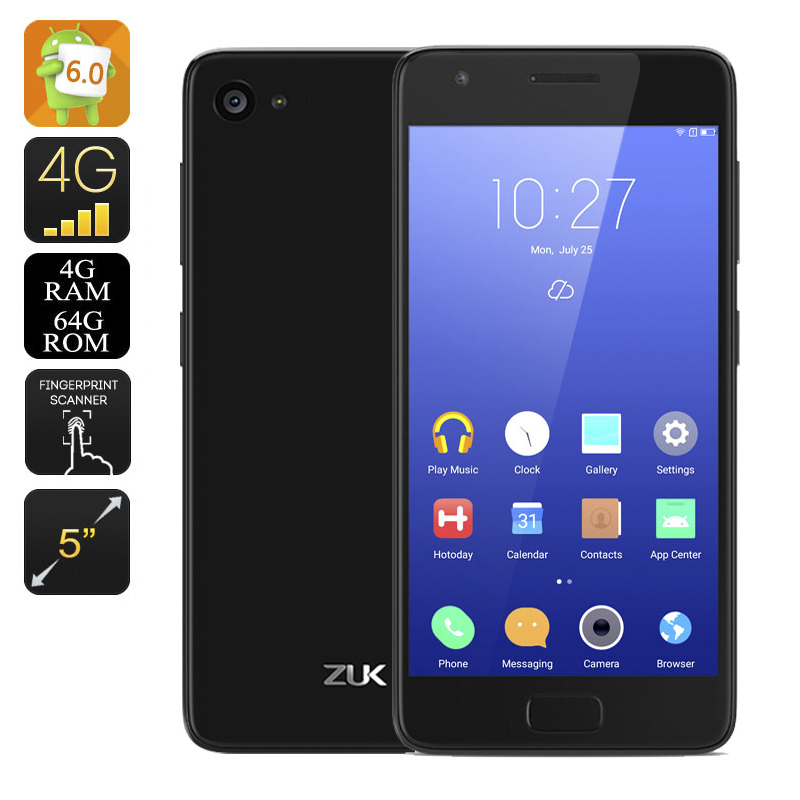 The Lenovo ZUK Z2 5 inch smartphone comes with a 12 months warranty, brought to you by the leader in electronic devices as well as wholesale Android phones..